Nouf, a sixteen year old girl hailing from a wealthy family in Saudi Arabia, mysteriously disappears three days before her wedding. Clues suggest that the girl was either kidnapped or she ran away to the desert. The family banks on Nayir, their trustworthy desert guide to find Nouf. Nayir combs the desert with his search and rescue team for two weeks, but to no avail. It is impossible for anyone to survive in the desert for this long a time, especially so for a young, wealthy girl, who’s been cocooned from the harsh realities of the world. 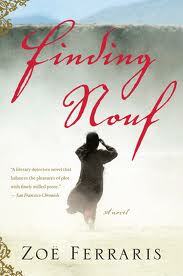 When Nouf’s body is found, Nayir’s obsession with the mysteries surrounding Nouf’s case deepens. In a land where women are veiled mysteries, and families regard their honor to be higher than the truth, Nayir wades his way through uncomfortable revelations about his beliefs and tradition as he pieces together the truth about Nouf. Zoe Ferraris has woven an engaging mystery in the heart of one of the most mystic lands. Through the detective plot, she brings alive the culture and traditions of wealthy Arabian families. I thought it was quite creative of her to employ a prudish, conventionally strict musilm man, Nayir, as the detective who discovers that he needs to understand the secretive world of Arab women, if he wants to crack Nouf’s case. Through Nayir, she shows the reader the perspective of a muslim man, the reasons for his prejudices, and the lens through which he views women. Through the course of the novel, as Nayir gets closer to the truth about Nouf, he also leaps closer to understanding why Nouf’s life had to take such a course. In other words, he transforms from an ignorant man to one who understands the world of women; their feelings, their thoughts, their ambitions, and their silent sufferings. His revelations make him reflect on his beliefs and traditions, which, contrary to his supposition, seemed to sometimes cause suffering and moral depravity. Ferraris manages to cleverly balance the wisdom contained in the Quran and the havoc it wreaks when misinterpreted with a cloistered perspective in the modern era. I appreciated the fact that she didn’t go overboard in criticizing the culture - as a matter of fact, she doesn’t really criticize. She merely presents the honest repercussions and suggests embracing rules and traditions, without losing sight of their deeper underlying principles. And it’s brilliant that she conveys all of this through the thoughts of the stringent Muslim man, Nayir. I laud this book for its creative attempt at ensconcing such deeper discussions on the Arabian culture and traditions within an engrossing mystery. The more the mystery gets unraveled, the more we grasp the complexity of the culture. On a certain level, the mystery is just secondary to the story, and I even had some quibbles with it, but it establishes a deeper connection with the reader to young girls like Nouf. Nayir’s gradual widening of his mind and heart is also realistically portrayed. In terms of writing, many reviews have generously praised Ferraris’s prose, but it didn’t really sweep me off my feet. It was crisp and vivid, and packages the story well. If you’re looking for a book that is both engaging and thought provoking, this book will fit the bill perfectly.